We stopped in at Mix The Bakery in Vancouver awhile back and picked up a loaf of their Cranberry Ginger bread. 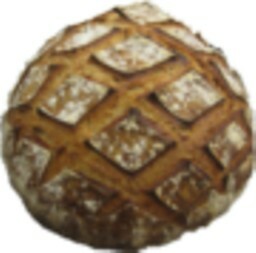 This bread was delicious! (I wish I'd taken a picture of it). Thinking about holiday 'gifts from the kitchen', I thought of this bakery's wonderful Cranberry Ginger bread. This is a first try at making this bread, using some local, fresh cranberries and ground ginger (along with a bit of lemon zest) for flavor; if I can get this loaf to the point where it tastes like the bakery's, I'll be happy to give this bread to friends and family this holiday season! here's the next one, looks a little bit better than the first? I tossed the cranberries in sugar prior to mixing them into the dough, but even still, these berries are tart! A little bit of honey on this bread brings the flavors into balance nicely; but the next time I make this, I will try dried, sweetened cranberries in place of fresh. The ginger flavor is faintly there in the background, so next time I may add some finely chopped fresh, or candied ginger, in addition to the ground ginger. I remember distinctly tasting ginger in Mix The Bakery's loaf; it tasted really good but was not overpowering, so it will take a little bit of tweaking in the next attempt. this contributed to the loaf! and beautiful execution breadsong! I'm going to put this on my holiday gifting list for sure. You might want to try slicing the fresh cranberries in half before you toss them in the sugar. It gives the sugar access to the inside of the berry, and the berry can absorb it more readily. It is tedious to slie the berries, I grant, but I've done it for a banana-walnut-cranberry loaf I make, and it does work quite well. Just make sure you give the berries a little time to absorb the sugar. I've also made the same loaf with rehydrated dried sweetened berries with good results, so you will probably find that acceptable too. A joyous holiday season to you and yours as well! Thank you so much for your kind comment, and for letting me know how you prepare your cranberries. I just picked up some more of these local cranberries today - I'll freeze them and try this bread again next weekend and sugar the berries as you've suggested. Thanks so much for your holiday wishes and for your helpful suggestion! What a fantastic stencil you have created for this loaf. Just beautiful. The fresh cranberries are incredibly bright. Amazing colour streaked through the crumb. I can remember a bakery near us that used to sell a fig and ginger sourdough that was full of large chunks of glazed ginger and dried figs. I am trying to think if I have ever eaten fresh cranberries. I can only think of frozen or dried ... a shame ... I will have to pay more attention. Thank you so much for your comment, and glad you like the stencil. Glazed ginger and fig sounds amazing. I was just kicking around the idea of fig and chestnut. How I do love holiday baking! Tantalizing ingredients...I wouldn't think of combining ginger and cranberries on my own but it sounds delightful so.....more fun ingredients to play bake with. Curious about the use of a poolish and a leaven. Why did you choose to use 2 preferments? I love the stenciling you did. What a shame to cut into it.. I've been looking at a formula in the Bread Bakers Guild of America archive called Appalachian Chestnut (Solveig Tofte's formula), which looks like lovely bread! (I've found some local chestnuts and want to try a fig and chestnut bread soon). This Guild formula uses some whole wheat flour in the poolish and levain, and I have some nice local whole wheat flour, so wanted to try this leavening for for my bread. I am glad I tried this, as we really like the flavor of the finished bread. Thanks so much, Janet (and I'm glad you like the stencil!). Thanks for the info...Think I will give this a try and see how my cranberry loving daughter likes it. Cranberries (Dried, apple juice sweetened) and raisins are her favorite bread fruits. I will see how she likes the tough of ginger...(We have a dog named Ginger.....) and how the poolish/leaven combo works out. Janet, I do hope your daughter likes this bread. Amazing and lovely looking bread from you as always. I looked at the photos of the crumb, and thought "need dried cranberries for that". Reading your text, I realise you have already come to that conclusion! Thanks for your comment; and after reading it am wondering if I can sweeten and dry the fresh cranberries I picked up yesterday (still hoping to use the local fruit in my bread!). The flavor of the fresh cranberries is just as bright as their color. Thanks so much for your compliments! Your cranberry relish sounds fabulous! Thank you so much for your comment, and mention of your wonderful-sounding cranberry-raspberry-ginger relish. I tried a fresh cranberry-orange relish for the first time last Christmas (Joy of Cooking recipe) and absolutely loved it; your variation sounds very tasty. It would be lovely if I got the same kind of result with the dried cranberries. It sounds like you've found lots of good applications for fresh cranberries (your lemon cake sounds fantastic). For bread, the cranberries were very juicy, and juice did run around the sides of the loaf where it had been scored. I was grateful for the parchment paper under the loaf to catch the drips! Beautiful loaf, breadsong, love the stencil! And the cranberries, I'm so glad you posted this. I've been considering a loaf with fresh cranberries for a while now. My first concern was the juice, and I wondered if I could lightly crush the berries and put them in the dehydrator for a bit. My second concern was the tartness, but a little (or maybe a lot, now that I've read your post) sugar could fix that. Then it slowly dawned on me that after all that work I would end up with... sweetened, dried cranberries. Oh. I already have those in the cupboard. I used some recently, soaking them in warm water for a couple of hours to hydrate them a bit, and also to hopefully soak away some of the sugar. It turned out well - hopefully I'll have time to post the next version. All that being said, if I had access to local, fresh cranberries... I don't think I could resist trying them either! I can't wait to see your cranberry bread - I know it will be gorgeous! Your bread sounds so delicious with all the various flavours of ginger, lemon, and of course our wonderful local cranberries. It's really a shame (in this case) that they tend to pop at the first sign of heat and create smearing on the what is a beautifully crumbed loaf. I'm not sure how to get around this problem other than dehydrating them, which is a shame as well to lose the bright flavour of the fresh berries. I suppose it's one of those unavoidable compromises we run into from time to time. What does Mix Bakery use in their version, fresh or dry? For myself I'd be quite happy to have a slice or two whole loaf of your bread just the way it is! Remembering the bakery's loaf, they must have used a quality dried cranberry. I wonder if a good compromise might be to partially dry some of my local cranberries, to reduce juiciness and hopefully preserve some of the original flavor? Thanks so much for your idea for ginger barm and ginger-water-infusion, might be just the thing to try for my next version of this loaf! Wow! Rye sour, levain, and poolish! Must be a wonderful flavor! Lovely stenciling, and shaping, breadsong. Thank you so much, Khalid!